RA Process — Lower JCT. 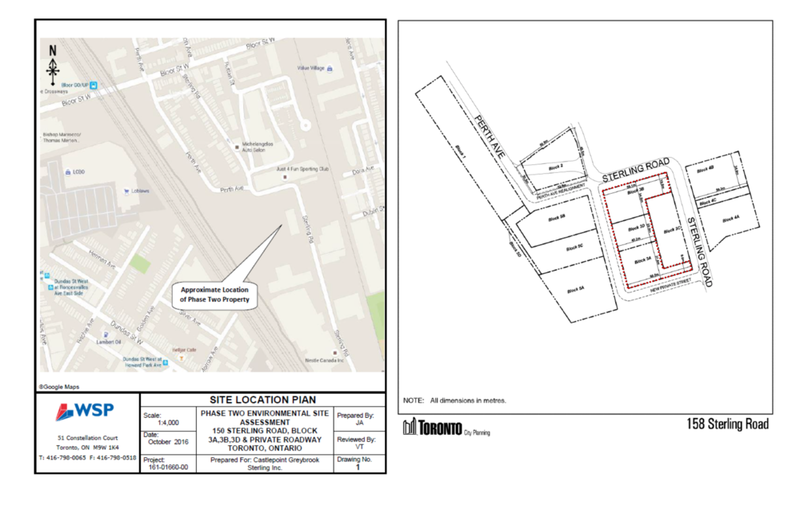 As part of an ongoing provincial evaluation process mandated under Ontario Regulation 153/04 (as amended), an environmental site assessment (ESA) and associated risk assessment is currently being completed for a portion of land (specifically Blocks 3A, 3B, 3D and a private roadway) of 150 Sterling Road in Toronto, Ontario. This is an approximately 1.63 acre area to the west of the 158 Sterling Road heritage building. Intrinsik Corp. and WSP Canada Inc. are working with Castlepoint Greybrook Sterling Inc., the owner of the property, to ensure that the redevelopment meets Ministry of Environment and Climate Change (MOECC) environmental policies. Due to its historical industrial use, primarily as an aluminum manufacturing facility and later for automotive parts manufacturing, there has been extensive historical and ongoing remediation of the site. Currently, there are still some residual contaminants in soil and groundwater on the property that do not meet the relevant MOECC generic soil and groundwater quality standards. To address these issues, this ESA and risk assessment process is being used to identify areas of concern and to develop property-specific standards for soil and groundwater, including implementing risk management measures, protective of human and ecological receptors under the sensitive land use category of residential/parkland/institutional land use. As more documents are submitted for MOECC review, they will be added to this list and available for public download and review.